We’re celebrating after being chosen to work with one of the UK’s most respected conservation charities. We are pleased to announce that we have secured a prestigious three-year contract with the National Trust, working with the charity to provide printed materials for its properties across the South West. SAPC is now the National Trust’s only preferred printing supplier from Cornwall, with the printing taking place at our modern and sustainable factory on the outskirts of the town. Liz Luck, South West Design and Production Consultant at the National Trust said: “We’re delighted that St Austell Printing Company were successful in joining our framework of printers serving the National Trust throughout the six counties of the South West. SAPC were selected to work with the National Trust after a thorough application process which reflected experience, product quality, service and environmental considerations. The contract will see us working with the organisation from Cornwall right through to Wiltshire. SAPC’s regional sales manager, Jon Hart said: “The National Trust is one of the UK’s most respected brands, and they put a lot of pride into their image and presentation. We are very proud to have been asked to work with them to promote their properties and events. 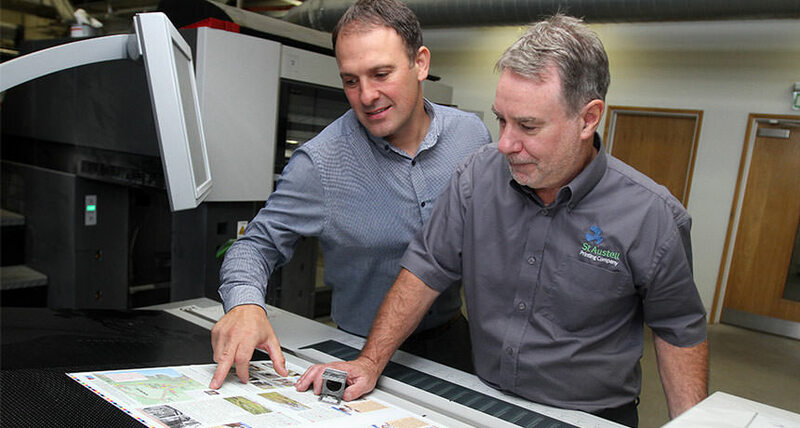 St Austell Printing Company has been trading since 1981, moving from our town centre facilities to a purpose-built factory at St Austell Business Park in 2013. We already work with established brands such as Whistlefish, TJ International, Rick Stein, Falmouth University and Winning Moves. Jon continued: “The National Trust wanted to work with a partner who would be a custodian of its printed materials. Environmental and sustainability were also a key consideration for the National Trust. “All of our paper is recycled or produced from sustainably managed forests, and our inks are all vegetable-based.